This article lifted directly from the What.CD wiki. Guide written by caaok. I'd like to thank the What.CD Delta Team for helping with comments and critique, and I'd especially like to single out PunkMeUp for his contributions. This guide was made for EAC version 1.0 beta 2 and will not completely work with earlier versions. Versions 0.99 or earlier should use the blowfish guide. Anything with a green outline around it is a required setting. Anything orange is required but depends on your drive. Anything unmarked is optional. So now let's look at the main window. Be sure everything is named correctly here, as these will be the tags on your ripped files. If you're ripping a classical CD, you may wish to fill in the Composer/Performer fields. Also note: the Comment field doesn't currently work. Drag a cover image into the EAC window. I think ~500x500 is a decent size in most cases. Google images is your friend here. If you're ripping a box set, you may wish to use the options under the cover image, otherwise leave them all as "1". Finally, if you want to add lyrics to the tracks, use the "Lyrics" button. Note: I've also highlighted the "New" button where you can save your settings. This is not a necessary step each time you rip. The pre-rip stuff happens here. 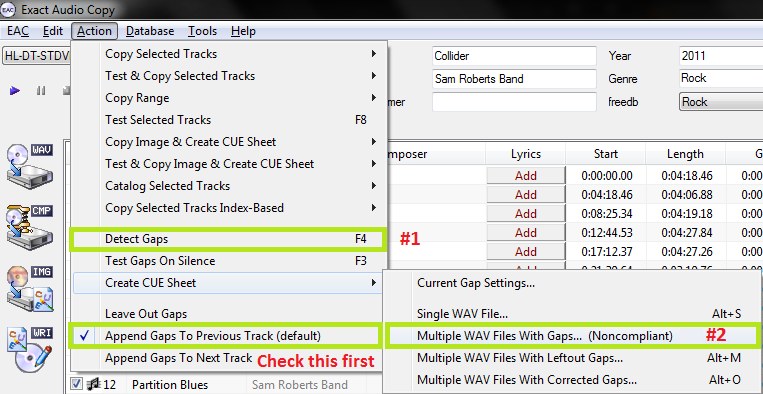 Make sure "Append Gaps to Previous Track (default)" is checked. It should be. Next, hit the options in the order shown. First, hit "Detect Gaps". This is very important, your rip will fail the logchecker if you do not complete this step. 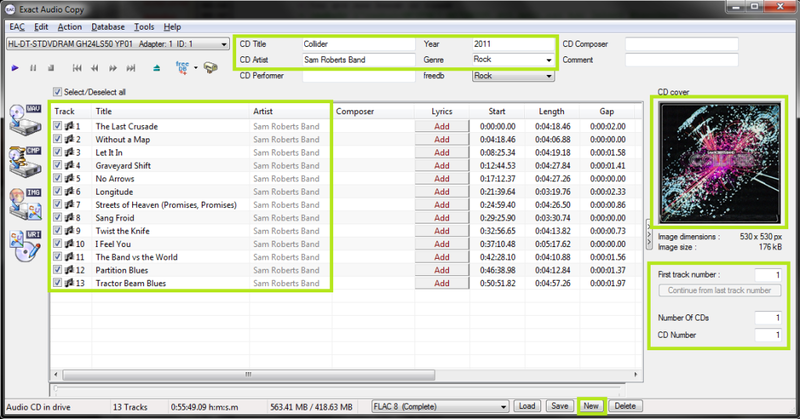 If the first track is highlighted in red, you have a hidden track. You'll want to look at this section of the blowfish.be guide. 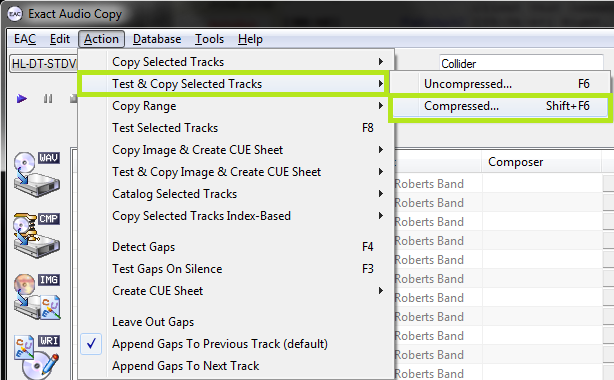 Next, go to Create CUE Sheet -> Multiple WAV Files With Gaps... (Noncompliant). This is usually where I create the folder for ripping as well. Do NOT rip your tracks to any directory containing your name. You should NEVER edit a log for any reason, especially now that we have checksums. A simple C:\EAC Rips is fine. However, as long as it contains the album name and no nested folders (don't do \Artist\Album\), you're fine by the rules here. Anyway, make the folder, save the .cue file into it. I usually just name mine Noncompliant.cue, it doesn't really matter. Finally, the rip itself! Make sure all the tracks are checkmarked in the main window unless there are some you don't want to rip. Test & Copy -> Compressed. Depending on your drive and whether or not the CD is scratched, this could take anywhere from ten minutes to four hours. Be patient. So you're done! You may wish to use logchecker.php to check and make sure your rip is proper, but if you followed this guide, the only possible errors would be with the CD itself. It does happen... some CDs are too badly damaged, even for EAC. Your best bet is to clean the CD and try again. Other than that, it never hurts to make sure your files are tagged and named properly (though they should be). Any extra stuff you want to include should be added now as well... Additional artwork, an md5 fingerprint, an info.txt file, that sort of thing. If you don't want to do any of that, it's time to find yourself an uploading guide! Last activity: 42 mins ago from 123.456.789.012.